11, 12, 13…just like that and here I am in Oslo again. The weekend in Longyearbyen went fast. Saturday and Sunday were spent in differing ways for various members of our cohort. Students worked on their project presentations and somehow a talk on outreach got thrown into the mix for Monday as well, meaning this guy had a bit of work to do a well (didn't want it to be a complete snoozer). Mike and Steve primarily spent the weekend organizing gear, preparing samples for shipment, and helping students with last minute project questions and I assisted where possible. The weekend was also a good reintegration to the workings of contemporary society where we got to practice things like walking around without a firearm and using currency (a quick swipe of the card and I had hot sauce just like that). 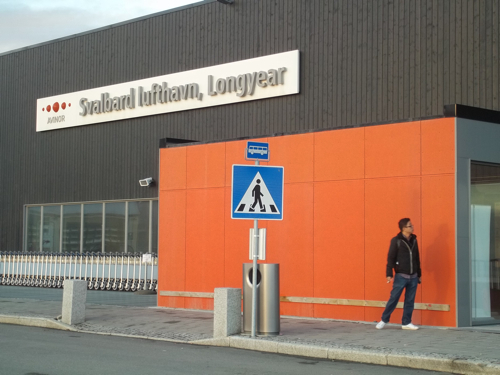 Luckily, Longyearbyen is enough of an outpost that none of us resurfaced too quickly and ended up with a case of 'civilization bends' though I was startled once or twice by the maniacal looking bearded man in the mirror. The front desk area of UNIS. 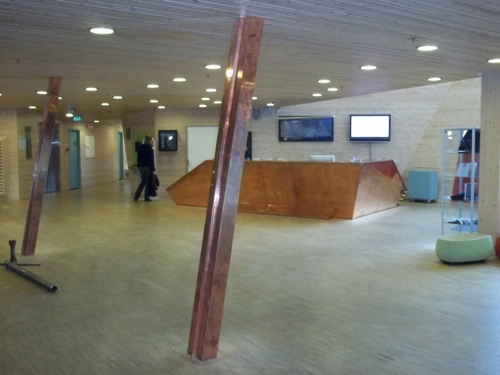 Lots of wood and oblique angles went into the construction of this building. When work was done for my presentation and there was no more gear to tackle I got a chance to explore UNIS a bit. This university is an incredible place and reading through the course book it seems like an adventure novel for anyone that loves the arctic and Quaternary geology. Over time I've gleaned a bit more about UNIS' purpose from the folks there like Hanne, Ole, and Sara and from what I've gathered all of the courses at UNIS are there because they can't be properly taught in any location other than Svalbard. That means there aren't your typical introductory chemistry courses or something like 'eco-poetics through from the ptarmigan perspective' don't make it to registration day. 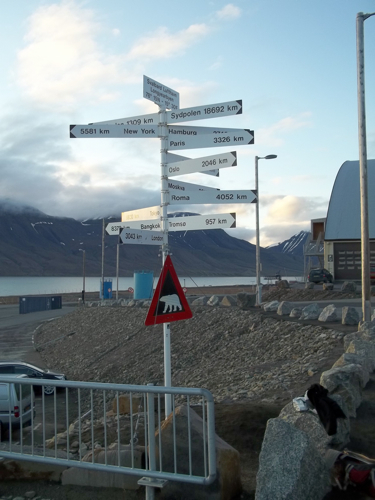 Rather, the arctic geology and biology classes are hit-the-ground running courses that have an immediate connection to arctic science and field work in the Svalbard landscape. 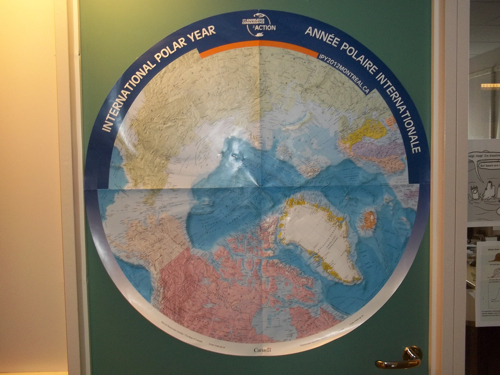 A poster in the halls of UNIS detailing the International Polar Year, 2007-2008. 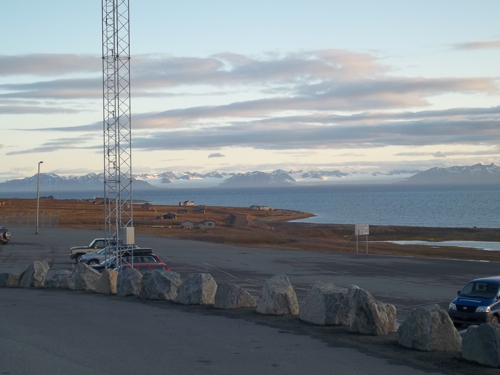 Monday was our last day in Svalbard and filled from start to pseudo-finish. 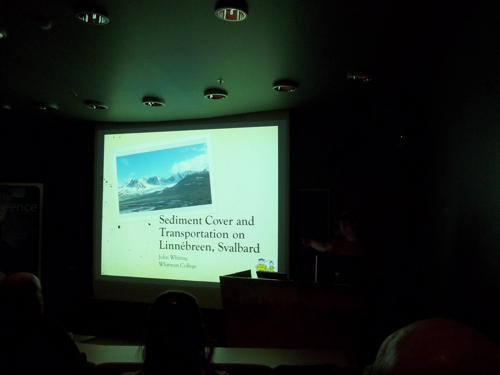 The morning commenced with a talk from Ole on 'Climate of the Arctic: Present and Past' that was very informative. His lecture style is very relaxed while being incredibly captivating. The talk was actually the second installment of lectures we were unable to finish up at Kapp Linne due to us all being exhausted at the end of a particularly long field day. One interesting aspect of his talk was the historical data he weaved into the climate records he showed. Often forgotten, historical proxies of climate change are one grouping of the main four (geological, biological, glaciological, and historical) that can be extremely useful in places like Europe where written accounts are well kept dating back over a thousand years. Such facts as a year where a polar bear ended up on the Faroe Islands or the account of Swedish soldiers walking across the sea ice to Denmark add an extra degree of the relevance of climate change to our activities as humans. Being a Dane himself, Ole noted that there is now a bridge to Sweden so they are working on slowly retaking what should be theirs had climate change not messed things up. After the talk and a quick break for lunch we headed for the main auditorium at UNIS for the final presentations of the field season. The REU students started things off with their talks, limited to 10 minutes with 5 minutes of question and answer. The purpose of their talks was to give an overview of their scientific question, a preliminary overview of their data, and an outline of how their work would unfold over the coming year off their thesis writing. I followed with a talk about outreach and outlined my work for PolarTREC thus far and where I planned to take it. I also tasked the students with a 'call to action' of sorts reminding them that they too are now responsible for outreach and outlined some ways that they could start. An example of this was something as simple as visiting their roots and potentially giving a talk to their old high school class that likely sparked their own passion for the natural sciences. I remember returning to Patti Millette's earth science class after my first field season in the arctic and finding it incredibly rewarding. As an educator now, I told them how psyched I would be to have a student come back to tell their tales in the high arctic. The last presentations came from the AG212 students giving their lake status updates, including Batesie Lauren Farnsworth '13 who will be extending her work on the karst lakes into a year-long senior thesis. One of my hopes is that when Mike joins my Environmental Science class for discussion later this year, Lauren will be able to come along and share her experience and research. A dark view of the auditorium and John's presentation at UNIS. Following the presentations the entire group amassed for one last meal at a local restaurant called Huset. We all happily ate 'american' hamburgers with fries, told stories from the field season, and then said our goodbyes to those who would not be traveling on to Oslo, Iceland, and then the 'States.' Mike, Steve, and I walked back to the main part of village with Lauren and Sara and made our final plans on the wake up time. To catch our 4:50 am flight we decided that 1:25 would be the alarm set to ensure an easy (-er) way through checking bags stuffed with samples. Sure enough, we all woke up on time and shuttled students and bags to the airport with time to spare. I celebrated with an early morning waffle with jam and brown cheese (I'll miss you brun ost) and avoided coffee to catch whatever z's I could on the plane. 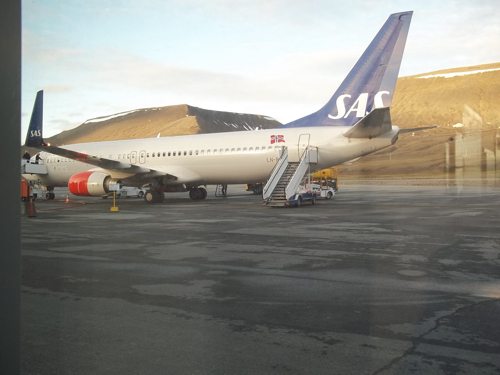 The flight took off without a hitch and we were sent off from Svalbard with some of the most breath taking glacier views I've ever seen along with a fly over of our field area where the last month was spent. A view of our ride home...global seed vault unassumingly in the background.